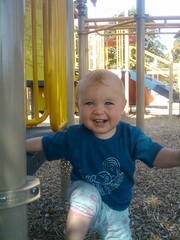 This happy child plays at the Santos Rodriguez Memorial Park. Photo by Melissa Jonas in the Beacon Hill Blog photo pool in Flickr. After extensive improvements to equipment and the addition of a covered picnic area, El Centro de la Raza opened the Santos Rodriguez Memorial Park playground to the public last summer. It’s been a hit with community members of all ages. But wait, there’s more! Through the Parks and Green Spaces Opportunity Fund, the Seattle Parks and Recreation Department awarded El Centro an additional $350,000 to improve the park further. To learn more and be part of the design process for the upcoming park improvements, attend the first public meeting about this project on November 15 from 6:30-8:30 p.m. at El Centro de la Raza’s Salvador Allende room, Room 106. El Centro’s address is 2524 16th Ave. S. Find out more about the project at the project’s website, or read the meeting flyer. 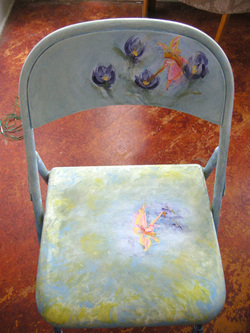 Art Chair #1, painted by Kathleen McHugh earlier this year. Photo courtesy of ROCKiT space. ROCKiT space is hosting a work party on Saturday, November 5 as part of a continuing project to decorate art chairs for community events. The “Have a Seat, Beacon” project, which began earlier this year, will create 45 chairs that are also individual works of art. This free workshop with Oaxacan and Seattle-based painter and print-maker Fulgencio Lazo will provide participants with the opportunity to transform a plain metal folding chair into a painted art chair. 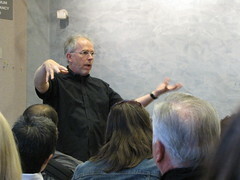 Space is limited, so the free workshop is open to the public by reservation. No experience is necessary, and the workshop is bilingual. For more information or to reserve a spot in the workshop, contact Sheba Burney-Jones at shebabj@gmail.com or 206-669-4574. A sturdy tent is being constructed for fire trucks to park in during the seismic upgrades at Station 13. Photo by Melissa Jonas. There’s lots of construction happening on the hill right now. Work on Beacon Mountain has begun in Jefferson Park. Fire Station 13 is getting a fancy temporary parking structure for the fire trucks in preparation for construction work to make the building more stable during an earthquake. The temporary public pay lot at El Centro is being graded and drainage installed; the goal is for the lot to be completed within a month. 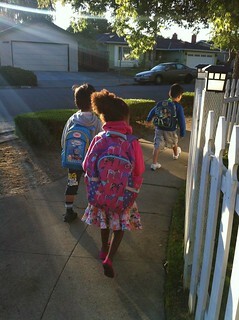 Each project is noteworthy in its own way, but all Beacon Hill toddlers and preschoolers need to know is: BIG TRUCKS! Lots of big trucks! Please allow extra time on your next outing to appreciate them. 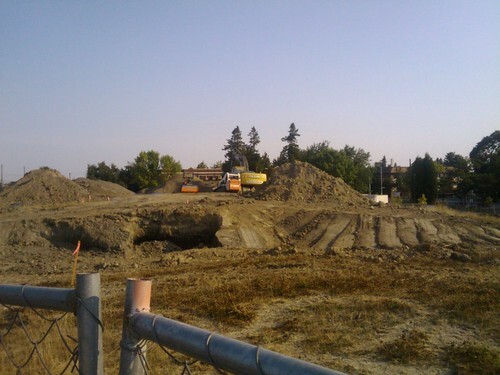 Construction of the Beacon Mountain Playground is underway. Photo by Melissa Jonas. For the first time in 18 years, the Piñata Party in the park has been rained out. Join volunteers, organizers, and the rest of your neighbors NEXT Saturday, July 23, from 3-6 p.m. in Stevens Place Park for music, food, and piñatas. Free fun for all ages! Beacon Hill is a great place for people of all ages and features many opportunities for entire families to have a great time. Here are a few ideas to get you started—please share your favorite places/activities in the comments! ROCKiT Space is thriving after the relaunch in January. Headquarters are now in the Garden House at 2336 15th Ave. S. (directly behind Baja Bistro; parking in the alley, on street or just walk there) and events are happening there and all over Beacon Hill. High Chair Happy Hour happens every third Tuesday (the next ones are on April 19 and May 16) from 3:30-6:30 p.m. BYOB (baby/bigger kid). It’s good, cheap fun on Beacon Hill: $5, or free for ROCKiT members. No alcohol sold, but you’re welcome to bring your own (as well as other food/drink) to share. Must be accompanied by a minor to attend. Tots Jam, a ROCKiT Space favorite, is held at El Centro every Wednesday at 9 a.m. Bring your toddler and $5 (free for members) and rock with Suzanne. 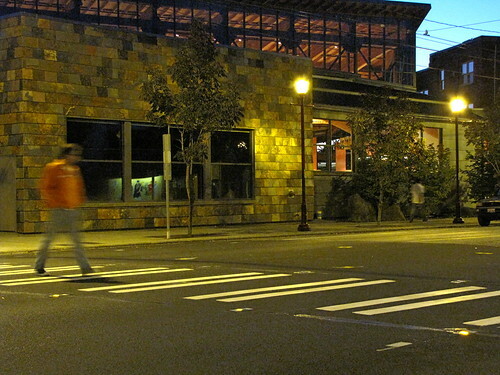 The Beacon Hill library has story times for toddlers, preschoolers, and the whole family. Toddler story time, Spanish story time, and Bilingual Kaleidoscope are only a few of the choices. Thanks to our neighbors’ successful efforts to improve the parks on Beacon Hill, we have three (3!) awesome new playgrounds on Beacon Hill. The play area at Jefferson Park has been open for several months. Don’t let the fences surrounding the future Beacon Mountain deter you—head over and check out the many ways your kids (and you) can climb, swing, hang and rock. Several refreshment options are available in the south end of our business district, including the Jefferson Park Field House, Victrola 3 and El Quetzal (now serving beer; just sayin’). Jefferson Park also boasts a fantastic indoor playground on Tuesdays and Thursdays from 9 a.m. to 2 p.m. Inflatables, riding toys, push toys, balls, and tons of other ways for toddlers to tire themselves are available for only $2! 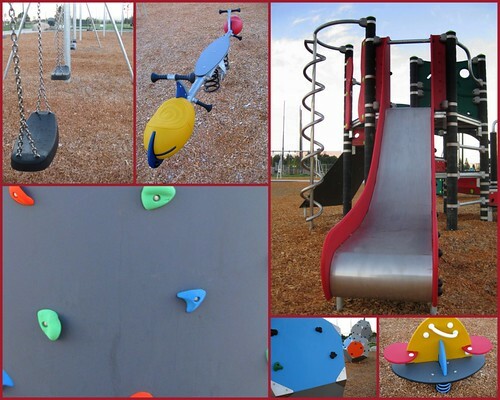 Santos Rodriguez Memorial Park at El Centro de La Raza is now open to the public (closed during posted hours to protect the safety of the children enrolled in programs on site) and features new playground equipment for a variety of ages. Amenities such as benches for parents and a permanent chess board are in the works. I highly recommend a visit to The Station (directly across the street) before or after your park visit. 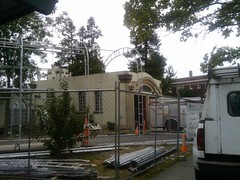 Beacon Hill Playground has new play structures, too! Swings, slides, a secure tunnel, and other fun await at our northernmost playground. I’m sure I”m missing something—please share your ideas/events in the comments! A few of the ways to keep busy in the playground at Jefferson Park. Photo by Joel Lee.